A court in Egypt has sentenced 69 Islamists to life in prison for setting fire to a church in a town near Cairo. Two minors were also jailed for 10 years for their alleged role in the blaze, which started when violence erupted in Kerdasa on 14 August 2013. A wave of unrest swept the country that day after hundreds of supporters of ousted President Mohammed Morsi were killed in a crackdown in the capital. Scores of churches and Christian property were looted and torched. Members of Morsi's Islamist movement, the Muslim Brotherhood, accused the Coptic Christian minority community of participating in what they denounced as a "coup". They cited Pope Tawadros II's appearance alongside then military chief - now president - Abdul Fattah al-Sisi when he announced that Morsi had been removed from office following widespread protests against him. 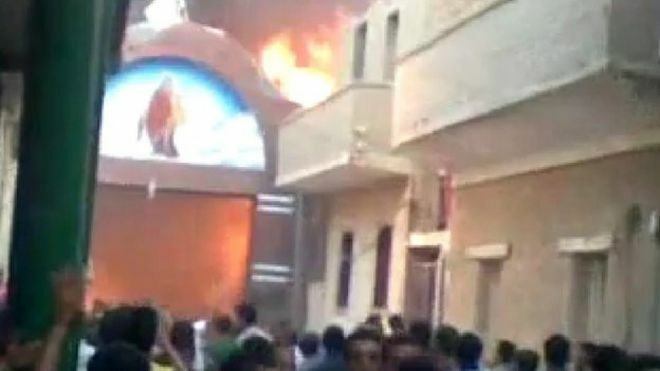 In addition to setting fire to the church in Kerdasa, the defendants sentenced on Wednesday were found guilty of attempting to murder civilians and possessing illegal weapons. However, one of the defence lawyers insisted "no proof" had been presented at the trial. "Even the church's priest said he didn't see any of the defendants after the incident," Hany al-Sayed told the Reuters news agency. Judge Mohammed Nagi Shehata sentenced 183 Morsi supporters to death in February after finding them guilty of killing 13 police officers in Kerdasa on the same day as the church attack. Human rights groups said that trial was grossly unfair and highlighted Egypt's disregard for national and international law. Hundreds of Muslim Brotherhood supporters, as well as several senior figures in the group, have been sentenced to death or life in prison after mass trials over the past two years which the UN has called "unprecedented in recent history". Last week, Morsi himself was jailed for 20 years after being convicted of ordering the unlawful detention and torture of opposition protesters during clashes with Brotherhood supporters outside a presidential palace in Cairo in 2012. In a separate development on Wednesday, another court sentenced 63 people to between one and seven years in prison in connection with violence inside al-Azhar University's campus in the capital in December 2013, state media reported.